From Satnews Senior Contributor for Asia-Pacific, Bob Gough, comes the news that the Australian Space Agency (ASA) has been operational for just over 60 days and, in that time, space legislation has passed both Australian Houses of Parliament. Industry forums have been held across the country in each state and territory, and the agency has also convened a national Space Coordination Committee. Pictured: Centre National d’Etudes Spatiales (CNES) President, Dr Jean-Yves Le Gall, CNES, with Head of the Australian Space Agency, Dr. Megan Clark AC. 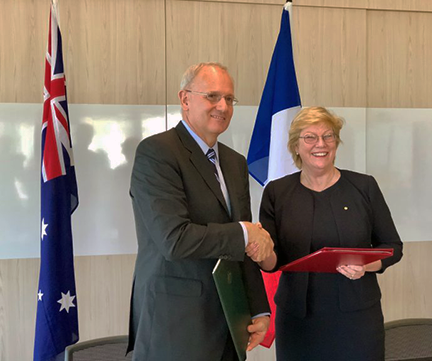 Recently, the ASA's first international Memorandum of Understanding (MOU) was signed in Sydney, joining with France to build space industry capabilities. Civil space engagement initiatives such as this with the French Space Agency (CNES) will explore advanced space technology and applications used in Earth Observation and remote sensing with satellites and high-altitude balloons, space operations and joint missions.